Over the years I have been influenced by a number of great authors. Their books have opened the doors to a world of wisdom and success. Each book is unique in the various facets and aspects they address, all have influenced me and my postings on the Tao Te Ching of Sales. I have linked the books to Amazon if you would like to purchase them. I receive no commission whatsoever in this case. It’s simply my desire to help and share those who have helped me. Good reading! In the past, selling was centered around the slick talking hucksters with fancy word play and closing techniques. This book places these archaic ideas in the rubbish heap. Instead , Miller-Heiman recommend a process of discovering the needs and desires of the buyer, and secondly how they intend on going through the buying process and making a purchase. With this knowledge, the seller is able to frame their solution conceptually in the buyer’s mind. This makes selling a collaborative event where both buyer and seller win. If you’re new to sales, start here. When I started in sales, I had found that our current market channel of internet advertising had it’s limits in lead creation. Having worked on some political campaigns in the past, cold calling came to mind to research the marketplace and prospect. I purchased a copy of this book at Borders (RIP) and was very pleased by the great advice on the essentials of prospecting, how cold calling can be a numbers game (have since modified my thoughts on this), how to find leads, how to write great scripts that intrigue the prospect, and how to sound confident and helpful, yet do it on a phone. This is a rock solid book I highly recommend. This was the first marketing book I’ve ever read and it inspired me on my lifelong desire to transform the world. This book takes the next step in furthering the “Adoption Curve” originally defined by Everett Rodgers. Moore explains the reasons that technologies start out hot and eventually hit a “chasm” that cannot be crossed and enter the mainstream. The author recommends that companies should court “early adopters” and kindly request them to work the kinks out of new products and services. Secondly, sellers need to realize that early adopters do not represent the mass of users. The majority have a different requirements, above and beyond the needs of the early adopters. If the majorities needs are not addressed, successful technology adoption across all users will not occur. This book and his follow up “Beyond the Tornado” are necessary for anyone looking to understand the needs of users and deploy new and transformational ideas. This book is all about the top decision makers in an organization. It provides various tactics on appointment setting with impossible-to-reach executives. Parnello calls these executives VITO (Very Important Top Officers) and they are indeed, the people who have ultimate veto or purchasing power. His section on cold calling is especially informative. He is a strong believer in the power of voice mail. By leaving a well scripted cascade of voice mails, you can slowly explain the benefits of your solution and generate curiosity and eventually get the appointment. This book has rock solid examples of scripts to build from. 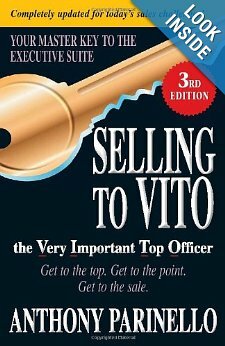 Don’t veto this VITO book. This book provide a consultive/solution selling strategy that instead of leading with the promotion of an existing product or service, the seller instead focuses on the customer’s pain(s). Once understood, the seller addresses the issue with his or her offerings. The resolution of the pain is what constitutes a true “solution”. Rackham does a fine job of describing various questions to uncover this pain: Situation, Problem, Implication and Needs/payoff questions (SPIN!). This book focuses on complex sales and how sellers can better walk in the buyers’s moccasins. It’s extremely helpful with practical examples. 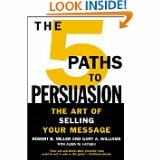 Robert Miller (of Miller/Heiman fame) works with Williams to describe the art of crafting your sales pitch, yet dependent on the type of individual your selling. They break down prospects into five groups: Charismatics, Thinkers, Skeptics, Followers, and Controllers. The strategy is to size up your prospect, and depending on their profile, work with a client that works best for them. The book has a plan of tactics that “custom designed” for each profile. Not all prospects are alike and the approach of asking questions work may not work for some people. The trick is to be “awake” to reading each person. To take special care and profile your prospects, honor the type of individual they are, and work within that context. Again it’s another opportunity to be fully aware and control the sale. A very good read. This translation of the 2500 year old work of Lao Tze does a marvelous job of uncovering the mysteries of the Tao Te Ching. The Tao is filled with paradox and puzzles. Yet the essence of balance and working within the reality of the world is clearly and poetically described by Mitchell. It is a difficult thing to translate ancient Chinese in our modern language and culture. Having read many translations I have found that many take license in imagery and language. This is a common complaint about the Mitchell translation, yet common in many others too. But if you have a true desire to understand the fundamental essence of Lao Tze’s teachings, this translation is in my experience the best explanation of the Tao. If you are new to the Tao, start here. This translation was my first exposure to the Tao Te Ching. It was a gift from a coworker who owned a used bookstore. It is lovingly illustrated and the model for this blog with it’s black and white photographs of nature. When I first opened the book I found it confounding and impenetrable, yet fascinating. Are these poems? Are these quotes? How can something be, by not being? It took many years before I was able to grasp the essence of the Tao (and even now, how much do I really know?) but I appreciate the work here of Feng and English for in my life they were able to light a candle that has yet to go dark and only grown brigher. Again it’s a beautiful translation and one I enjoy paging through again and again. I’ve read many books on Eastern thought, but this little transcription of De Mello’s seminars are the clearest, funniest, hardest and most honest descriptions of the notions of Lao Tze, Buddha, Meister Eckhart, Hildagard of Bingham, Jesus Christ and any number of thought leaders. Challenging at times, but always the coach, De Mello asks rhetorical question after question. These are no doubt difficult questions that most people sweep under the rug. But during those times when frightened and confused , De Mello provides us assurance to “Wake Up” and relax . Read this and see how you can live your life bold and with adventure.